bukit timah cicada is a node of syntfarm. It is a result of a "hiking and counting" activity that took place at the bukit timah nature reserve, singapore. this element of syntfarm is driven by the idea to preserve and archive perceived and recorded conditions, impulses, and experiences from various spaces and times. 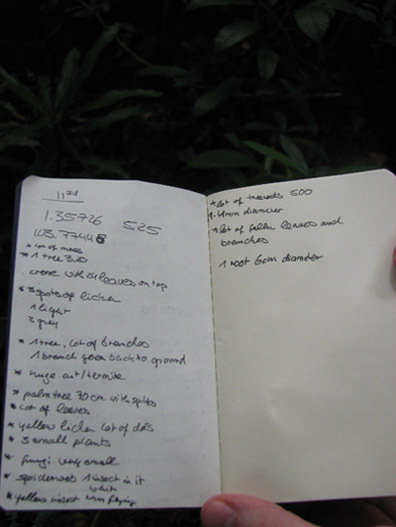 the overwhelming data from the Bukit Timah Nature Reserve are stored on various platforms including photos, videos, sound, gps data, hand writings, etc. the collected impressions were transcoded into the audio visual performance syntfarm 0.1, which took place on the 29th of april at "pitch black", singapore. our first task was to create a system that would be able to store data, enable its tactile use, and share the performances for other people's reinterpretations and uses. at this stage, we have a digital instrument which enables us to perform and interpret levels of the complexity and infinite layering of impulses from the forest. in the following edition, we will release the instrument, which would have all the presets and our performances, stored in a digital format and would be available for public use. while working and performing with our instrument, we created a collection of synthetic soundscapes and visual habitats. these habitats will play a major role in the constitution of the first syntfarm ecosystem that is planned to happen by the end of 2007. 1 large screen projection, 1 robust sound system, 2 laptops, 1 joystick, and 2 performers. the visuals and the audio software are written in processing and are preferably performed on an os x system. We arrived at the Bukit Timah Nature Reserve at 9:30AM. this is a tropical primary rainforest cutout from the secondary forest by the express highway. It is a 164 ha plot which makes it the largest remain of primary rainforest in Singapore. Located at 137 km north of the equator, it hosts around 840 plant species and 500 animal species. when we arrived it was already very hot and there were a lot of people in front of the visitor center. for the ease of moving quickly, we designed an acrylic plate that could hold the following: a gps device, an ipod that was connected to an accelerometer which was attached to the Andreas’ shoe, and a cellphone for sound recording. the gps signal was quite weak because of the dense canopy spread. after climbing a steep road, we entered the trail which was not crowded much and increasingly we started encountering the rainforest in a very impression driven way. the numbers of natural impulses were overwhelming and their complexities on various levels were developing. everything could be experienced gradually and we were bombarded with the bio-data. our task was to examine several sites by counting and noticing various life forms. entering the forest, was quite a change from where we came from and a very high humidity helped us make everything around us completely wet: cameras, gps, backpacks, and us. sounds of green cicadas (Dundubia frame), crickets, falling leaves, and some birds were cosmic. not only the frequencies and sinewaves produced, but their layering and constant expending multiplied the dynamics of the system and formed this very complex rainforest ecosystem performance. the first site to examine was near the hut/shelter on the yellow route. we encountered several different forms: a spider, a lot of fallen leaves, branches, few plants, and a few small ants. Next to this were two Giant Forest Ants (Camponotus gigas) which were kind of nervous and were quickly and territorially moving on a fallen tree trunk. we noticed one type of large lichen which later we kept seeing everywhere. Lichens are very interesting organisms that are mutual collaboration of algae and fungi that results in a new life form. they can survive severe de-hydrations and very harsh environments. most of their mass is water and they grow very slowly. also, they are natural sensors for air pollution. in the city areas you can barely see them and the forest was full of them. They were following us until the end of the trip. amazing sound didn’t stop progressing and telling us stories and in one moment, the family of Long-tailed Macaque monkeys (Macaca fascicularis) were just walking on a fallen tree about 10 meters from us. they looked amazingly busy and were heading to a very long trip. at the second location to examine there was a nice tree with a branch which was making a ring and growing back to the ground. A few plants ranging from 5cm to 80cm, two different types of fungi and one interesting thing to notice was the layer made out of fallen leaves and branches that were degrading into lower levels of the soil. thousands of tiny roots could be seen and black and wet soil was evaporating so that you could feel its smell. similarly to the sound, the earth was nonlinearly layered… we spotted one more Giant Forest Ant. we headed forward and then a butterfly died in front of us. sound, lichen, fern and then a lot of moss. huge rocks covered with moss. everything was wet. we realized how slow we were and next examining section came after one hour of hiking. the square meter we examined was covered with thick tree roots rhizoming and capturing dirt, moss, and fallen leaves. a plantain squirrel (Callosciurus notatus) performed a two-meter jump from one branch to another, above my head. while heading back we got slower because of the impulses and new layers that seemed like they were now exploding. lianas, vines, butterflies, epiphytes, moss, lichen, fern, everywhere… the trees felt like they had stories on which there was always a different frequency emitter. the canopy gaps would mark that there is a dead or dying tree - a bearer of the primary forest. those are the places in the rainforest when you get the strongest beam of sunlight. they are extremely hot and drier than other areas. 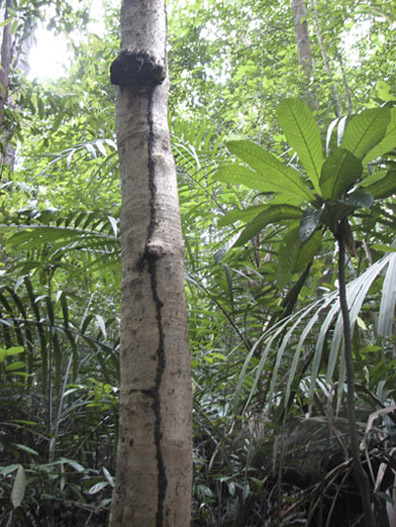 we spotted one of the dipterocarts - Seraya Shorea curtisii, a tall tree with a beautiful crown that was d(r)ying. on a black tree trunk, we saw white fungi. we were back at the visitors center at 1:59.